The Pew Internet Project has previously released reports on some of the particular uses of the internet that occurred in the 2010 midterm elections—including how people used mobile connections via their cell phones and laptops to participate and learn4 and how social media tools like Facebook and Twitter became a more central part of the campaign environment.5 This report covers more broadly the way that people used the internet in the 2010 contest compared with other media, how they used it to share information and deliberate with others, and how they used it to participate in the political process. Go online to take part in specific political activities, such as watch political videos, share election-related content or “fact check” political claims – 53% of adult internet users did at least one of the eleven general online political activities we measured in 2010. Use Twitter or social networking sites for political purposes – One in five online adults (22%) used Twitter or a social networking site to interact politically in one way or another in 2010. Taken together, 73% of online adults did at least one of these during the 2010 campaign, which works out to 54% of all US adults. The online environment has changed dramatically since even the previous midterm elections in 2006, making it somewhat difficult to compare the overall size of the online political user cohort over time. To use one example, in late 2006 just 16% of online adults used an online social networking site such as Facebook or LinkedIn and our post-election survey did not contain any questions about the use of online social networks for political purposes; as of November 2010 the social networking population had risen to 61% of internet users and these sites had become a key element of the modern political campaign. However, even as our definition of an online political user has changed over time to accommodate these broader developments it is clear that the politically-active online cohort has grown significantly since the previous midterm election: in 2006 we found that 31% of all US adults were online political users. 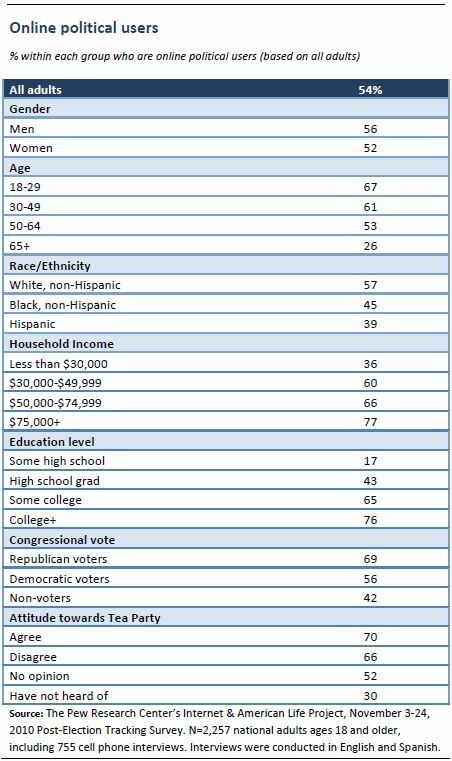 Three-quarters (77%) of these online political users go online wirelessly using a cell phone or laptop, and nearly nine in ten (87%) have a broadband connection at home. This group voted for Republican candidates over Democratic candidates in 2010 by a margin of 49%-35%.